Mc MURDO BASE, ANTARCTICA – W.A.P. The Chapel of the Snows and its history. chapel, the Chalet served as the site for the community’s religious services. However, this building, which normally houses NSF and contractor offices, could not accommodate both Sunday morning services and daily administrative activities during the summer season. On Easter Sunday 1979, the temporary chapel was dedicated. The current chapel was constructed over four summers and completed in 1989. Volunteers using salvaged material built the only know house of worship in Antarctica. The McMurdo Station Chapel of the Snows sits on a knoll overlooking McMurdo Sound, the peaks and glaciers of the Transantarctic Mountains, across the bay from Mount Discovery. It is the world’s southernmost building constructed for religious services. From the March, 1989 Antarctic Journal..
McMurdo Station once again has a permanent place of worship. To commemorate this occasion, approximately 80 people gathered on Sunday, 29 January 1989 to dedicate the new Chapel of the Snows, which is the third chapel to be raised at the station. Just 840 miles from the South Pole, the Chapel of the Snows is the world’s southernmost building erected primarily for religious services. It also is the only known house of worship in Antarctica. Situated on a knoll overlooking McMurdo Sound and the peaks and glaciers of the Transantarctic Mountains, the new chapel replaces the temporary building, a makeshift hut, that has been used for religious services and related activities for 11 years. Stained glass window inside the Chapel of the Snows. The window overlooks McMurdo Sound. The Transantarctic Mountain Range can be seen in the distance on a clear day. The hour-long dedication ceremony attracted an overflow crowd from McMurdo Station and Scott Base, the nearby research station operated by New Zealand. The service included piano music, hymns, and readings from the Bible. Lt. M. Brad Yorton, chaplain of the U.S. Navy’s Naval Support Force Antarctica, whose support includes religious services at the station, presided. Also participating in the ceremony were Ronald R. La Count, the senior U. S. representative in Antarctica at the time of the dedication; Captain Dwight Fisher and Commander John V. Smith, the commanding officers of the Naval Support Force Antarctica (NSFA) and the Antarctic Development Squadron Six (VXE-6); Neal Terry, personnel coordinator for ITT/ Antarctic Services, Inc, (NSF’s support contractor); and guest speaker Father Gerard Creagh from Hoon Hay Parish in Christchurch, New Zealand. in their space time. He also cited official reports that documented over the years the significance of worship for those at the station, whose work took them far from their families and their home communities. 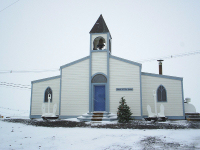 This service marked the second time that Father Creagh had participated in a ceremony to dedicate a site for religious services at McMurdo Station, as he was the invited speaker in 1979 when the community gathered for a similar service recognizing the makeshift chapel that has been replaced by the new structure. In his address he praised those who built the chapel in just 4 months. “The result is truly deserving of the accolade found in the twenty-first chapter of the Book of Revelation: This is God’s dwelling among people. Science Foundation’s plan to refurbish the McMurdo Station. The 2,016-square-foot wood structure contains office space, a central worship area that normally seats 63, and McMurdo’s only organ. Materials to complete the building were salvaged from older structures that were ripped down during the several-year rebuilding of the station. Thanks and credit to the following web sites and to the writers of this articles from which we did take part of this notes.